It’s the 15th of the month and after a bit of a break, I’m back with a card for the Crafts-U-Love Design Team. This month I received two Julie Hickey stamp sets: Family Sentiments and Floral Fusion. I pulled out my distress oxides and started stamping! Once I was happy with my background, I spritzed the card generously with water to activate the Oxides and cause the inks to bleed a little. For the sentiment, I combined some words from Julie’s set and added a die from my collection (Creative Expressions Happy Birthday die – brilliant price point on these!). I’m excited that today marks the first day of another 30 Day Colouring Challenge. I love playing along and I’m hoping to colour something every day during this challenge. Let’s see how that goes! I’ve also decided to set myself my own ‘sub-challenge’! I have LOTS of wood-mounted rubber stamps which I cannot bear to part with. And I remember buying them all! They are like my Christmas ornaments – they all have a story/memory! Anyway, I have rarely played with them in recent years so I’m going to use them exclusively for this colouring challenge. So with that in mind, here is my car/colouring for Day 1 using a super Deco Roses image by Stampendous which I embossed and coloured with my Twinkling H2Os. I added a sentiment from Simon Says Stamp that I stamped in green Brilliance ink and then added a few Nuvo glitter drops as my little finishing touch! I’m going to enter this into the current CAS on Friday Challenge (birthday) plus the current Addicted to Stamps Challenge (Anything Goes). The colour palette over at this week’s Color Throwdown Challenge is blue, aqua and white. Perfect for wintery or watery scenes, right! I spent a little while trying to creating a scene-based card, but ended up going with something a bit different! I used a polka dot background die from My Favorite Things to cut a couple of distress oxide backgrounds. For my first card, I stuck the individual dots onto a white base card and added a Penny Black die cut sentiment to finish off the card. I used the background panel from the aqua dots to create a super simple second card showcasing the same colour combo. It’s time for a new challenge over at AAA Cards and this fortnight we are challenging you to use up to a third of your CAS card. The rest of your card should be completely ‘clean’. The optional twist is ‘masking’. Our sponsor is CAS-ual Fridays. For my card, I use stamps from an older Simon Says Stamp set called ‘Oh Happy Day’. I stamped the large flower first, masked it off and then stamped the smaller flowers. I then added masks to the smaller flowers before stamping the leaves. I removed the masks and coloured the flowers using my Twinkling H2Os. To finish off my card, I added a Clearly Besotted sentiment and a few of my favourite Nuvo glitter drops. 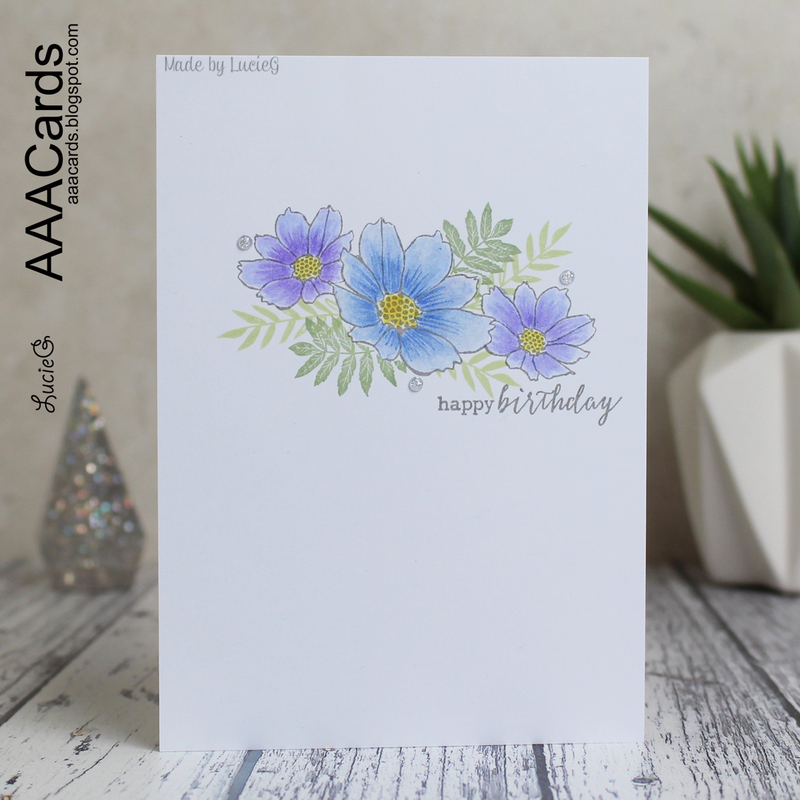 My teammates have come up with some gorgeous inspiration over at the AAA Cards Challenge blog. 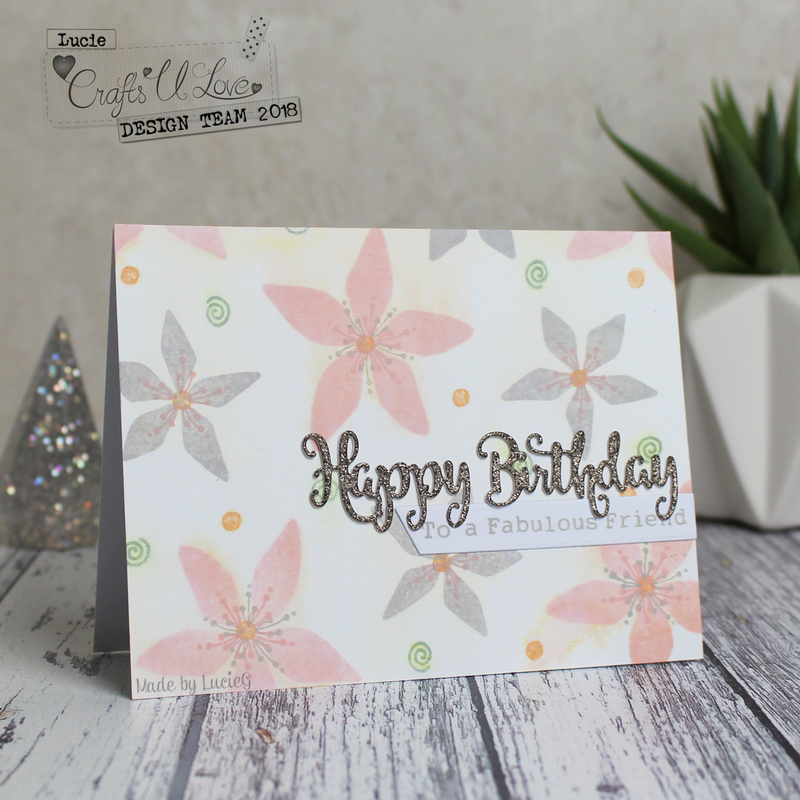 We are also joined by our Guest Designer – the talented Julie who has some gorgeous cards over on her blog, Crafted by Jules. I’m playing along with this week’s Freshly Made Sketches Challenge. I decided to use some older Poppystamps Deco Roses corner dies that I’ve had for eons! To die cut the roses, I used some mirror card and a left over background that I had created using Ken Oliver Colour Bursts and some Cosmic Shimmer pixie powder. I really must get inky and create some new backgrounds soon – it’s so much fun to just get inky at times, isn’t it? Anyway, I embossed a Deco sentiment from Woodware and then assembled my card. Think this one took me longer to photograph than create! It’s so difficult to capture that pixie Powder shimmer!